Welcome to the Winter Solstice 2017 issue of Eternal Haunted Summer! 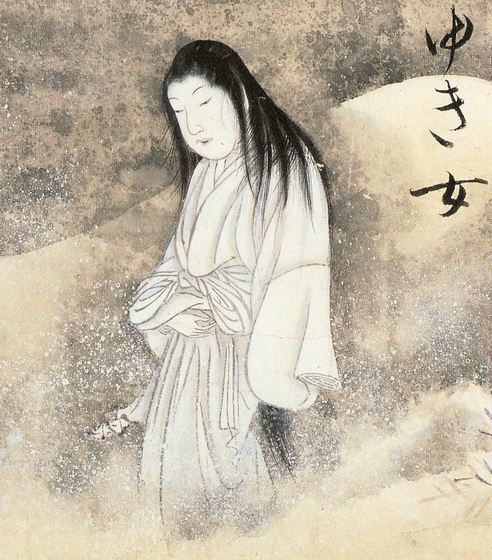 “Yuki-onna” (snow woman) from Hyakkai-Zukan by Sawaki Suushi. Image courtesy of wikimedia commons. In Poetry, Cameron Coulter makes his debut with the haunting “The Anthem of Stardust,” as does Zachary McGar with the Greek-inspired “Apparatus Criticus.” TJ O’Hare returns with “The Divine Hag of the Celts,” while Deborah Davitt looks to ancient Hellas for “Diwia” as does Alison Rumfitt in her EHS debut, “The Fifty Daughters of Danaus.” Allan Rozinski mixes ancient mythology and modern psychology in his debut “In the Labyrinth,” while Evelyn Deshane looks to the Greek Goddess of memory in “Mnemosyne (A Villanelle).” A different Goddess is the focus of Jennifer Lawrence’s “The Morrigan at War,” and Bettina Theissen returns to EHS with “One Spark.” Amy Karon makes her debut with the seasonally-appropriate “Solstice,” while Chelsea Arrington sings the praises of a misunderstood monster in “Sonnet in Honor of Medusa.” Kaye Boesme returns with the angry and challenging “What Remains in the Ruins,” while Kyle Hulbert and Scott J. Couturier make their debuts with “Wolfheart (A Tribute to Skadhi)” and “Yule-Telling,” respectively. Finally, Reviews! EHS editor Rebecca Buchanan delves into A Dance With Hermes by Lindsay Clarke; Grimoire of a Kitchen Witch: An Essential Guide to Witchcraft and The Kitchen Witch’s World of Magical Plants and Herbs by Rachel Patterson; and Snowspelled by Stephanie Burgis. Erin Lale looks at four different titles: Handbook for Mortals by Lani Sarem; In a Cat’s Eye edited by Kelly A Harmon and Vonnie Winslow Crist; Norse Revival: Transformations of Germanic Neopaganism by Stefanie von Schnurbein; and Worshiping Loki: A Short Introduction by Silence Maestas. iPagan, edited by Trevor Greenfield, and The Way of the Lover: Sufism, Shamanism, and the Spiritual Art of Love by Ross Heaven are reviewed by Evelyn Deshane. Pagan Portals: Gwyn ap Nudd by Danu Forest is reviewed by both Hayley Arrington and by Nicole Perkins, while Chelsea Arrington looks at Pagan Portals: Have a Cool Yule: How To Survive (and Enjoy) the Mid-Winter Festival by Mélusine Draco. Finally, Rex Butters offers his thoughts on Spirits of the Sacred Grove: The World of a Druid Priestess by Emma Restall Orr. Enjoy the issue! And Happy Solstice! Happy Yule and Winter Solstice! My short story “Ghazal” has debuted in my favorite literary magazine – a retelling of a Thousand and One Arabian Nights with rocs, poet queens of Paradise, and necromancy galore! Check it out!